Considered “vulnerable” road users, motorcycle and moped riders face different risks on the road to drivers in other vehicles—mainly due to their size, speed, and positioning on the road. Motorcycles are vehicles with the same rights and privileges as any motor vehicle on the roadway. But still, statistics show motorcyclists are often put in extreme danger. According to NHTSA, motorcyclists accounted for 14% of all traffic fatalities in 2015, while motorcycles make up only 3% of all registered vehicles in the U.S. Per vehicle mile traveled, motorcyclists are about 27 times more likely than passenger vehicle occupants to die in a motor vehicle crash, and 5 times more likely to be injured. As Spring arrives, so too does May’s Motorcycle Safety Awareness Month, a national and state initiative aimed at getting motorists and motorcyclists to "Share the Road" with each other. Throughout the month, local, state, and federal agencies are reminding drivers to share the road, safely and smartly. Use this list by the U.S. Department of Transportation to keep yourself in check as a skilled driver. 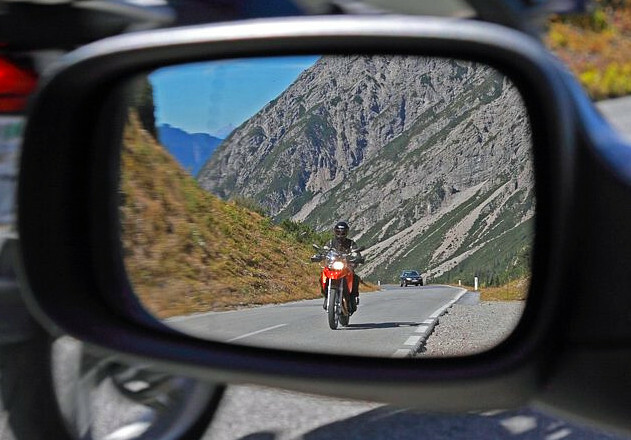 Do you adhere to these motorcycle safety tips when behind the wheel? Slow down, assess your surroundings, and don’t rush when crossing intersections, entering the roadway from a parking lot or driveway, or turning left. Always give yourself enough time to thoroughly check for motorcyclists. When turning left, ensure there is enough time and space for the motorcyclist to clear the roadway before you initiate the left turn. Don’t follow motorcyclists too closely and allow sufficient braking cushion between your vehicle and the motorcycle in front of you to give your vehicle enough room to come to a complete stop without a collision. Remember, a motorcyclist’s brake lights might not always be engaged when a motorcycle decelerates. Always double-check your blind spots when changing lanes or starting to enter or exit roadways. Adjust your rear- and side-view mirrors and use them properly. If someone you know drives a motorcycle, tell him or her to always wear a helmet—even if the law doesn’t require it. According to NHTSA, an estimated 740 lives could have been saved in 2015 if all motorcyclists had worn helmets. Wear brightly colored protective gear and a DOT-compliant helmet. Red, yellow, orange, and white are highly visible and help a rider stand out. Use reflective tape and stickers to make you more visible to other motorists. Strategically use your lane position to see and be seen. Always use your turn signals each time you turn or change lanes, even if you think no one will see it. Combine hand signals and turn signals to draw more attention to yourself. For more information on motorcycle safety, read “Writing a Two-Wheeler Rider Handbook: Safety on the Road,” on eDriving.com.